Slowly but surely, I’m convincing my wife that everything really does taste better on the smoker. Her latest challenge, “Traeger smoked burgers always turn out dry when you cook them on the smoker”. 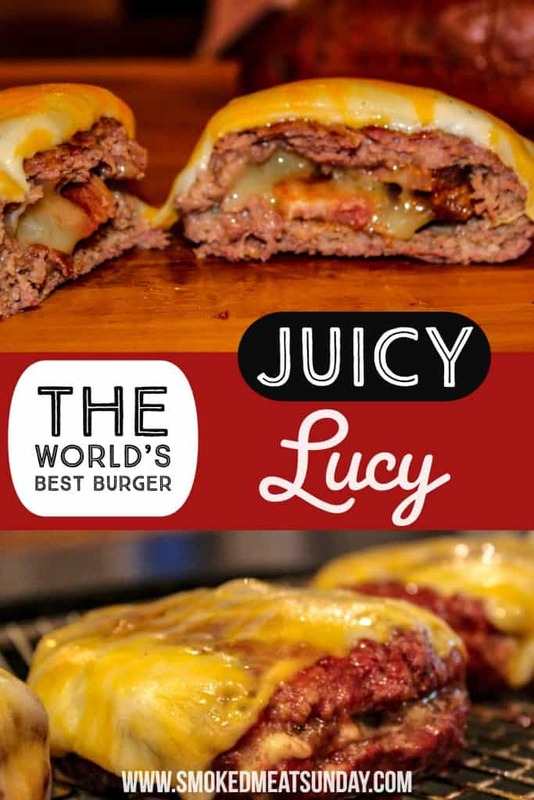 Enter the Juicy Lucy Recipe. Now you and I know that statement isn’t true. 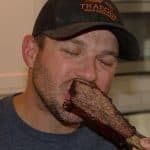 Traeger Smoked Burgers are NOT dry! I just had to prove her wrong. 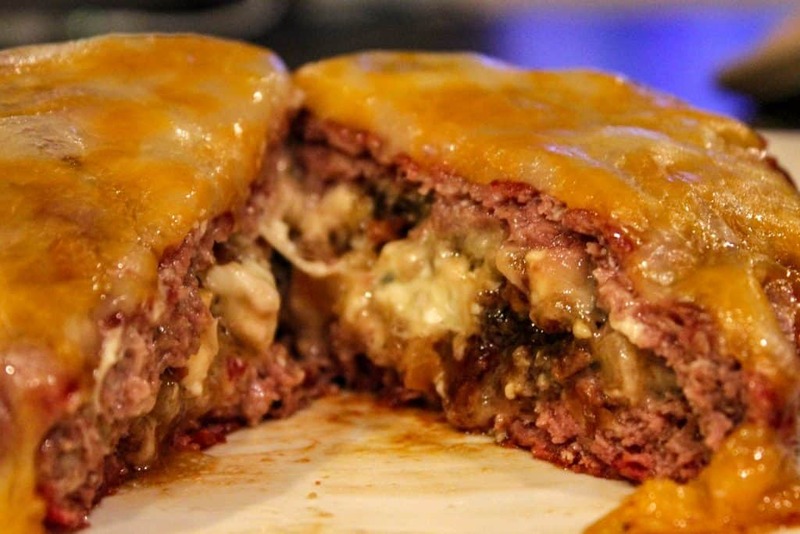 I decided we were going to make Blue Cheese Stuffed Burgers with my Juicy Lucy Recipe. The result? The most delicious, melt in your mouth, tastebud explosion with every bite burger, I’ve ever had. Even better? My wife agreed. These burgers truly will make you a star at the next family BBQ. Looking for something different? Check out my bacon wrapped meatball. Looking for something a little more simple? These Smoked Burgers hit the spot EVERY TIME. I knew I was going to be at my brother-in-law’s house for the Vikings vs Saints game – what an ending, by the way – so I prepped these burgers in the morning. First, I cooked a pound of bacon on the Traeger. If you haven’t cooked bacon on your pellet grill, you’re missing out. I like to glaze my bacon with some maple syrup, and then sprinkle it with brown sugar. The bacon goes on the smoker for about two hours at 225 degrees. Make sure you’re not hungry when you make the bacon. It’s easy to eat all of it in one sitting! After I put the bacon on the Traeger, I diced up half an onion. I cooked it over medium heat for about 15 minutes in a tablespoon of garlic infused olive oil. When the onion started to brown a little, I removed it from the heat and placed it in a container. I wanted all my ingredients for my Blue Cheese stuffed burgers to be cold, so I placed the onions in the fridge while the bacon finished cooking. At this point, you should be excited. If you haven’t had a Gourmet Juicy Lucy, your taste buds are in for a treat. When the bacon was done I ate half of it, and then placed the rest in the refrigerator. It’s a weakness, and I have a problem. Don’t judge me. Once the onions and bacon were chilled I removed them from the fridge, along with blue cheese crumbles, and shredded white cheddar. In a large bowl, I added the onions (about 1/2 a cup), 2 slices of crumbled bacon, 2 Tablespoons of blue cheese crumbles, and 2 tablespoons of shredded organic white cheddar cheese. Everything was mixed together with a wooden spoon. In a second large bowl, I put one pound of Snake River Farms 85/15 hamburger, 1 egg, and a half cup of almond meal. Using my hands I mixed everything together. The burger mixture should be wet but if it’s not holding all of the egg, add a little bit more almond flour. Line a cookie sheet with foil, and then make 8 equally sized balls using all of the burger. Flatten one of the balls until it’s a patty about 1/4″ in thickness. Place about 2 tablespoons of the blue cheese mixture on top. Be sure to keep the mixture away from the edges. Flatten another hamburger ball into a patty and place on top of the mixture. Carefully press down the edge of the top patty into the bottom, eliminating the seam. I repeated this process for the other three burgers, and then wrapped each burger individually in saran wrap, and placed in the fridge. The burgers were chilled in the fridge for about 4 hours. When I was ready to cook, I turned my Traeger on. Once the smoke was established I raised the temp to 225. When the pellet grill was up to temp I removed the burgers from the fridge and placed each one of them on the grill grate. After an hour I added one slice of American cheese to each of the burgers and raised the temp on the grill to 350. Five minutes later I removed the burgers from the Traeger, and my family indulged in the best burgers we’ve ever had. While I was making these burgers I could tell they were going to be tasty. I was a little concerned with how thin the Snake River Farms hamburger patties I made were, but that turned out not to be an issue. 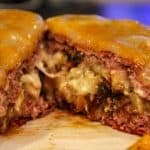 This Juicy Lucy Recipe creates a hamburger that is moist and flavorful with every bite. In fact, I ate mine without condiments or a bun! Do yourself a favor. Buy some Snake River Farms Hamburger and the rest of the ingredients for this Juicy Lucy Recipe. Your family will thank you. These are the best burgers I've ever had. Seriously. No Joke. THE BEST EVER. They're the Michael Jordan of hamburgers. Don't even try telling me Lebron is better than Jordan either. He's not. Cook the bacon on your smoker. If you haven't cooked bacon on your pellet grill, you're missing out. I like to glaze my bacon with some maple syrup, and then sprinkle it with brown sugar. The bacon goes on the smoker for about two hours at 225 degrees. Make sure you're not hungry when you make the bacon. It's easy to eat all of it in one sitting! After you put the bacon on the Traeger, dice half an onion. When the bacon is done dice it, and place in the refrigerator. Once the onions and bacon are chilled remove them from the fridge, along with the blue cheese crumbles, and shredded white cheddar. In a large bowl, combine the onions, crumbled bacon, blue cheese crumbles, and shredded white cheddar cheese. In a second large bowl, combine your burger, egg, and almond meal or flour. Add salt and pepper too. Combine with your hands. The burger mixture should be wet but if it's not holding all of the egg, add a little bit more almond flour. Flatten one of the balls until it's a patty about 1/4" in thickness. Place about 2 tablespoons of the blue cheese mixture on top. Be sure to keep the mixture away from the edges. Flatten another hamburger ball into a patty and place on top of the mixture. Carefully press down the edge of the top patty into the bottom, eliminating the seam. Repeat this process for the other three burgers, and then wrap each burger individually in saran wrap, and place in the fridge for an hour. 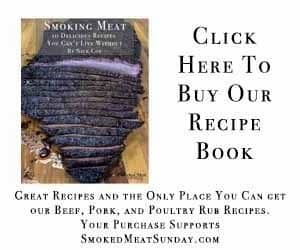 When you're ready to cook, get your smoker set up to cook at 225 degrees, and then place the burgers directly on the grill grate. After an hour add one slice of American cheese to each of the burgers and raise the temp on the grill to 350. When the cheese is melted the burgers are ready. While I was making these burgers I could tell they were going to be tasty. I was a little concerned with how thin the Snake River Farms hamburger patties were, but that turned out not to be an issue. These burgers were moist and flavorful with every bite. In fact, I ate mine without condiments or a bun! Use a quality thermometer to check the temp of the burgers before you pull them from the grill. I like the internal temp of my juicy lucy's to be 145 degrees.